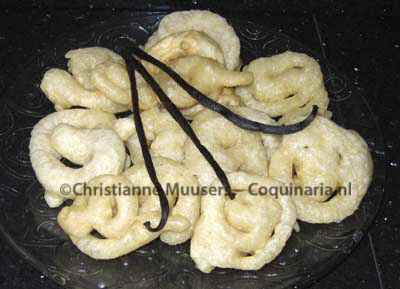 Moutayes are sweet fritters from the Mauritian cuisine. This recipe is published with the recipe for Vindaye, Mauritian fish curry. See that page for information on the history of Mauritian cuisine. In case you didn’t know: the isle Mauritius is situated in the Indian Ocean, East of Madagascar. As with the vindaye, the recipe for moutayes is from Deux siècles de Cuisine. Héritage de l’Isle de France from Jean-Claude Hein (see bibliography), who used the notebooks of his grandmother dating from late nineteenth and early twentieth century. In the manuscript there is a name behind the title of the recipe, ‘Gopal’. When I asked him what this meant, M. Hein wrote that this is the name of the cook who worked for his grandmother at the time and helped her with the recipe. The use of ‘¼ livre de levure’ (a quarter pound of yeast) and the many hours needed for rising would indicate that leaven (sourdough) was used instead of yeast. In my adaptation I used dry yeast, because my own batch of leaven has recently died and I haven’t yet been able to start a new one. But if you have a batch of sourdough, take one decilitre of it instead of yeast and lessen the amount of water accordingly to four deciltiers. Let the dough rise for at least two hours. You may use a little dry yeast to give the leaven a boost if you think that is necessary. In most of the ‘sourdough’ breads you can buy today there is some yeast added anyway. The recipe below for Moutayes is, just as the recipe for Vindaye (a fish curry), from Heins book Deux siècles de cuisine (see bibliography), p.263. A note on the translation. In French it says ‘huile de pistache’. I have translated that with ‘peanut oil’. This is not a mistake, on Mauritius peanuts are called ‘pistaches’. Just so you know. Proportions: 1 livre de riz malgache – 1 1/2 livre farine de blé – 1/4 livre de levain – 3 tasses à dejeuner d’eau – un peu de vanille – 1 litre 1/2 d’huile de pistache ou deux livres de saindoux pour la cuisson, fournissant environ 125 moutayes. Laisser le pâte fermenter huit à 12 heures, selon la saison et l’endroit oú on la placera. 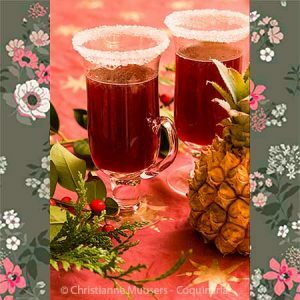 3 livres de sucre pour le sirop, une gousse de vanille. Ingredients: 1 pound Madagascar rice, 1 1/2 pound wheat flour, 1/4 pound sourdough, 3 cups water, a little vanilla, 1 1/2 litre arachide oil or two pound lard to fry, for about 125 moutayes. Let the dough rise for eight to 12 hours, according to the season and where it will be put. [Also] 3 pound sugar for syrup, one vanilla pod. To prepare rice flour the rice must be soaked for two hours in cold water, then left to dry in the sun. Then one can grind them on the (grinding) stone, sift it in and put it again out in the sun to dry, to prevent the flour from fermenting, especially when it was prepared the day before. Add the water and the mixed flours to the sourdough with the vanilla, and leave the preparation in the same mixing bowl. Cover with a cloth and leave it next to the oven. When the dough has risen and is about to be cooked, a small amount of water must be added to it if it is not fluid enough. Then pour it into a perforated coconut shell and let it run into the frying oil before taking out the pieces and dipping them into the hot syrup that has been prepared in advance. This dessert belongs to the same family as the Indian Gulab Jamun and the English Doughnut: they are all deep-fried and dipped into syrup immediately afterwards. The moutaye is a spiralled pastry, five to seven centimeters in diameter (2 to 2¾ inches). To make that spiral requires some expertise: the batter must be poured into the frying oil whilst making a spiralling movement. The original recipe prescribes using a perforated coconut to let the batter run through. I have tried this, but the batter had to be so liquid to be able to run through the eye with any speed at all, that I finally gave up and used a large piping bag. I also decided not to use the electric deep-frying pan, because the batter would sink too fast before surfacing again to form a spiral. Gebak of nagerecht, 16 tot 25 stuks; voorbereiding 15 minuten + 1 uur rijstijd; bereiding 20 minuten. Make the batter – Combine both flours with salt and dry yeast (if you use that). Split the vanilla pod and scoop out the black seeds, add these to the flour. Now add the tepid water and work it into a dough. Cover the bowl with a damp cloth and let the dough rise for an hour. Make the syrup – Put together sugar, water, the empty vanilla pod from making the batter and the seeds from a new vanilla pod. Bring to the boil, let the sugar dissolve and cook gently for five more minutes. Tap the dough to make it collapse, then add about 1/2 decilitre tepid water. Stir to a smooth batter. Pour a layer of oil (about two centimetres/¾ inch) in a low, wide pan (no teflon), heat the oil to 200 °C/390°F). Scoop the batter into a piping bag with a nozzle (smooth or serrated, the endresult will be the same). Now pour the batter into the hot oil (be careful!) with a spiralling movement. You can bake batches of four to five moutayes at a time in a frying pan of 22 centimetres/9 inches in diameter. Fry the moutayes for three to four minutes, until they have a turned a very light brown. Drain the moutayes, then let them swim in the warm syrup for a minute before serving. Immediately. The moutayes will go soggy when you allow them to stand for some time. 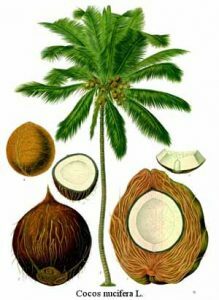 The fruit of the Cocos nucifera is more than the hairy nut you buy at the store. The coconut is a drupe, like peaches and apricots. But whereas you eat the flesh of a peach and throw away its stone, with the cocnut the husk or exocarp is removed before shipping, leaving just that stone. The stone is hollow, with three ‘eyes’ on one end. If ever the seed germinates, the shoot will emerge through one of those eyes. In an unripe coconut the hollow is filled with a not very pleasant liquid. As the fruit ripens, the liquid gradually solidifies at the inside of the stone, becoming the white coconut meat. The remaining liquid will become sweet and quite good to drink. Note that what we call ‘coconut milk’ is NOT that liquid, but the result of soaking grated coconut meat in warm water and straining the resulting liquid. When you have bought your very first coconut, you may scratch your head and wonder how to open it. First you have to drain the remaing liquid from the nut. 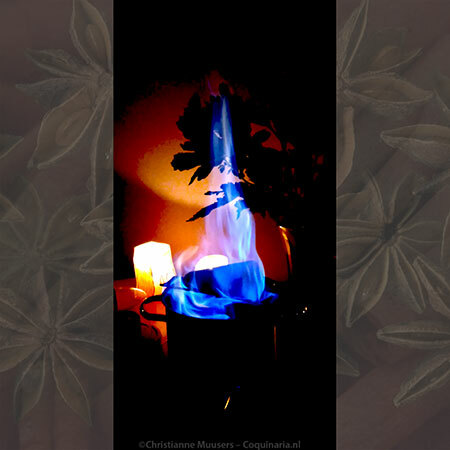 Perforate two of the eyes of the nut with an awl, hold it upside down, and catch the liquid in a jar. If you’re lucky, it is tasty enough to drink. Then, just place the nut on a hard surface, and give a little tap with a hammer on the ‘equator’. Roll, tap again, roll, tap, roll, tap, and suddenly your coconut has split in to! Another method is to tap the nut itself with the ‘eye’ side downward on a realy hard surface, the nut will split lengthwise. Coconut meat is radiantly white. You’ll have to pry it loose from its shell. Maybe there is an easy way to do this (please tell me! ), but my way is simply to take a sharp knif and start with cutting loose small pieces of coconot, then, as more is removed, larger pieces can be pried loose. The thin brown skin with which the white coconut meat adhered to the nut shell can be eaten, you do not need to remove it. However, if you plan on grating the coconut, the skin has to be removed. Together with potatoes and cacao, the vanilla pod (Vanilla planifolia) is one of the ingredients originating from the New World. 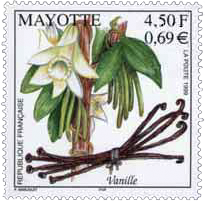 Nowadays vanilla is mainly grown on islands in the Pacific Ocean. The flowers have to be pollinated by hand, because the hummingbirds and insects that take care of that in Central America are absent in the Pacific region. 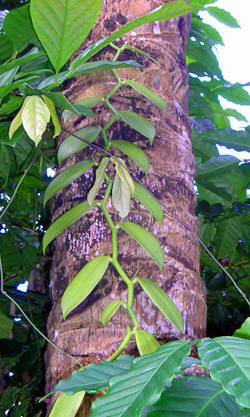 Vanilla pods are the ‘fruit’ from the vanilla orchid, a climber. The pods are harvested before ripening, steamed and fermented. If you cut the pod open lengthwise you can scoop out the very small black seeds to use in dishes. You can also use the pod itself, but that has to be removed before serving. You can also buy synthetic vanillin, which is a lot cheaper, but also a lot less in flavour. Jean-Claude Hein, Deux siècle de cuisine. Héritage de l’Isle de France, Mauritius, 2001. With thanks to Monsieur Hein for kindly answering my questions.